The Nationalism Project Blog: Welcome to The Nationalism Project Blog! 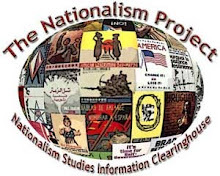 If you’re reading this, the chances are that you are aware of The Nationalism Project (TNP), now roughly ten years old and probably the most heavily trafficked nationalism studies resource on the World Wide Web. I first had the idea for the site during the mid-1990s but did not launch TNP until starting graduate school and after a meeting with Rudy Koshar and Thongchai Winichakul. My initial thought was to do an online journal, but through the course of our conversation it became clear that such an undertaking was unrealistic and unnecessary. Instead, Thongchai suggested a “clearing house” for nationalism studies information. That is exactly what The Nationalism Project is about. This blog represents an extension of that mission. Although the reflections posted here are mine and mine alone, the goal is to promote dialogue about nationalism-related issues and concerns. Just as on the main website, my goal is not to forward any specific political position. Rather, I would like to raise nationalism-related questions as they occur to me and to encourage you to respond. Thank you for using The Nationalism Project and I look forward to your responses to this new undertaking.